"Pesto, goat cheese and sun-dried tomatoes come all together in this quiche that I created myself. This is a perfect combination of flavors that will make you appear like a chef when you serve this plate to your friends." Preheat the oven to 400 degrees F (200 degrees C). Spread pesto evenly in the bottom of the pie crust. Sprinkle goat cheese over pesto. In a large bowl, beat together eggs, half-and-half cream, and flour. Season with salt and pepper. Pour over goat cheese in pie crust. Arrange sun-dried tomatoes on top. Bake in preheated oven for 30 minutes, or until done. Decadent but worth the splurge. Very flavorful! 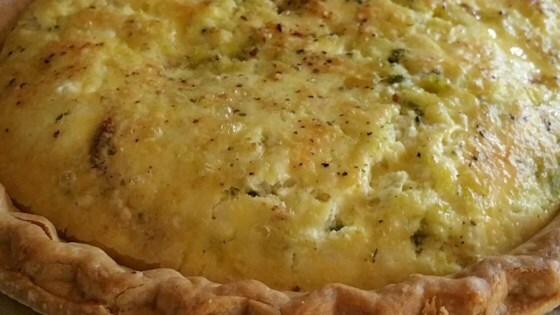 A different quiche recipe that got rave reviews at my Mother's Day brunch. Will make again!! This was a very good mix of flavors. I used cresent rolls for the crust and sun-dried tomato pesto.